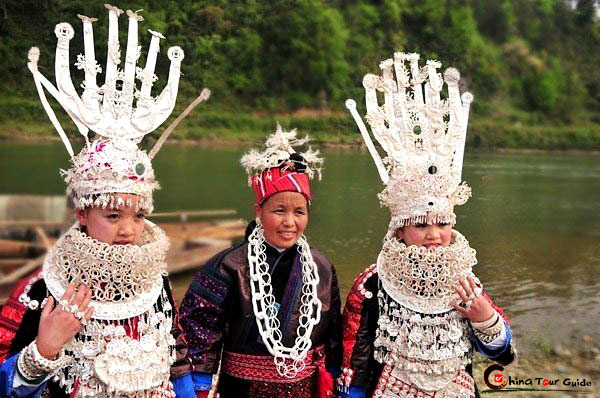 The Miao and Dong people in Southeast Guizhou like to hold the "Bullfight" competitions in spring and autumn. Bulls used for fighting are specially raised and are entitled "king bulls" or "holy bulls". During the festival, families and villages around the bullfight ground prepare feasts to entertain the coming guests and welcome the "holy bulls" from different places. Some bulls for fight are decorated with iron horns, covered with red satin,with pheasant tail on the back and bronze bells on the neck. Some bulls are decorated with big silk balls, colorful ribbons and bronze bells on the waist, and with a tiger tail. They look like generals ready to go out to battle. The entrance ceremony of the bullfight is called "stepping ground". 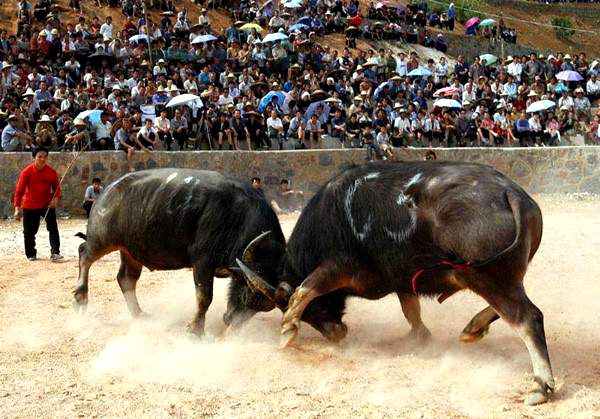 In recent years, during Kaili international Lusheng Festival, over on hundred buffaloes participate in the competition, with huge crowds of people watching by. The grand spectacle is bustling with noise and excitement, and with a deafening sound of gongs and drums. Watching two bulls fighting furiously at the festival.